A contemporary angular design Milan LED thermostatic bar shower valve with slide rail kit is designed and manufactured using the finest methods and materials to ensure a high quality product. With it's clean lines the Milan shower will naturally blend in to and compliment any modern bathroom. Our state of the art thermostatic showers ensure that you will enjoy your shower at your desired temperature regardless of any other running water in the home. 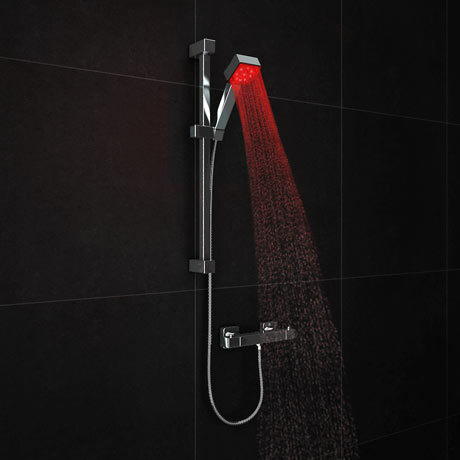 Features a square LED chrome finish shower handset, lights up in three different colours dependant on the temperature of the water. Manufactured from durable corrosion resistance chrome plated plastic. No batteries are needed as the LED shower head is self-powered by the force of running water. Certain parts are chrome plated plastic, not metal. The only parts that are not plastic are the shower valve, rail and the hose.